Patrons have the ability to cancel their own event registrations made in SignUp. 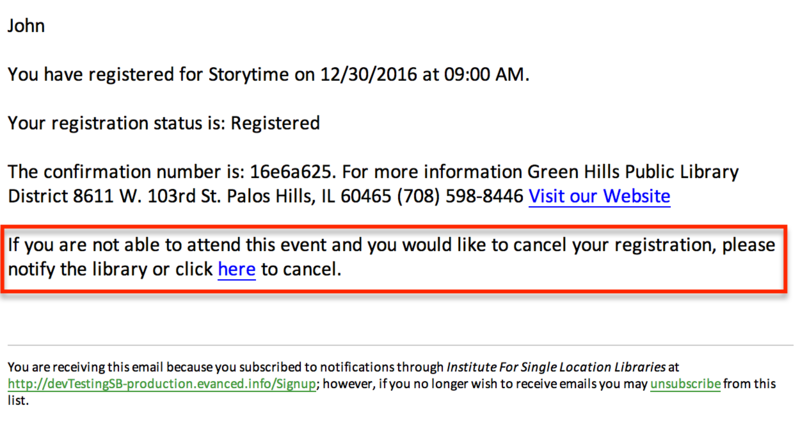 When a patron receives a confirmation email or reminder email for an event, a link is provided to cancel the registration. Upon clicking the cancellation link, the patron is directed to SignUp and is provided with a prompt to confirm cancellation. Clicking "Cancel Registration" will place the patron on the event's "Cancelled" list and the patron will receive an email notifying him or her the registration was officially cancelled. Summary: Patrons have the ability to cancel their own event registrations in SignUp. Posted - Tue, Nov 15, 2016 at 4:17 PM. This article has been viewed 10201 times.